Hastings Priory Cricket Club is through to the quarter-finals of the Gray-Nicolls Sussex 1st XI T20 Cup. The Sussex League Premier Division outfit won by 18 runs at home to Division Three East leaders Portslade on Sunday to set up a last eight trip to Worthing on July 1. Priory spinner Jack Coleman tosses one up against Portslade. Priory posted 146-9 after winning the toss and choosing to bat. Several batsmen made decent starts without going on to make the big score which might have taken the game away from the opposition. James Pooley (30 off 27 balls) and Joe Billings (22 off 19) put on 39 for the first wicket before Pooley and Jake Woolley (26 off 15) added 41 for the second. Priory then slid from 80-1 to 86-4, but Greg Devlin (38 off 28) and Harry Scowen (11 off 11) forged a fifth wicket stand of 40. The hosts lost three wickets for one run at the end of the innings, two of them during a final over in which only a single was added to the total. Portslade scored just eight runs off the first five overs of their reply in the face of some fast, accurate bowling from Adam Pye (4-1-8-0) and Adam Barton (4-0-18-2), leaving them with a mountain to climb. Greg Devlin goes on the attack during the latter part of Priory's innings. The scoreboard gradually started to tick over once Priory took pace off the ball, although Portslade still found the spin of Jack Coleman (4-0-30-1) tough to get away at times and the required run rate climbed to around the 10-per-over mark. Priory always seemed to have the upper hand, although Portslade were never quite out of it. Pooley (3-0-15-3) bowled tidily and took three wickets, one of them thanks to a superb catch on the deep midwicket boundary by Harry Scowen, who took great care to avoid stepping on the rope. One big over raised Portslade’s hopes of a possible upset, but first Pooley, and then the return of speedsters Pye and Barton at the end, ensured they came up short, finishing on 128-6. Barton, wearing on a cast on his non-bowling hand to protect the thumb he broke recently, bowled two batsmen in the final over, the second of them the ball after being hit for six over mid-on. Adam Page tries a reverse sweep. The previous day, Priory lost by 10 wickets away to leaders Roffey in the league, continuing a tough run of results at what is anything but a happy hunting ground for them. The visitors elected to bat after winning the toss, but were all out for 105 in 44.3 overs with only one player reaching 20. Priory began well enough with an opening stand of 36 between James Pooley - back to the top of the order after a week in the middle - and Joe Billings. But after Pooley was caught for 18, which included two sixes, the innings went into decline. Billings, fresh off his magnificent 143 against Horsham the previous weekend, looked good until being trapped leg before for 29 to leave Priory 51-2. They then lost two wickets with the score 61, including Ryan Hoadley for 11, and one more a run later to sit 62-5. Adam Pye charges in during an impressive spell with the new ball. Jake Woolley and Harry Scowen advanced the score to 88 before Woolley was leg before for 16. Two more wickets went down with the score 95, and another four runs later. Priory did at least scrape into three figures before Jack Coleman was last man out for one off 23 balls. Scowen finished 12 not out from 59 balls. 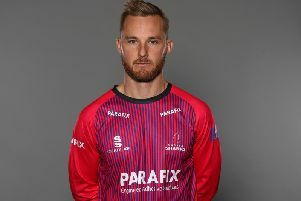 Alex Collins was the stand-out bowler for Roffey with 5-25 from 9.3 overs, while Rohit Jagota took 3-18 from eight and George Fleming 2-38 from 18. Roffey needed just 16.3 overs to reach their target against a Priory attack missing John Morgan and Adam Barton. Theodore Rivers made 55 not out (11 fours and a six) at a run a ball and Jagota 48 not out from 45 balls (four fours and four sixes). Spinner Jed O’Brien (7-3-29-0), who opened the bowling, was the only Priory bowler to pick up a maiden, three of them in fact, and go for less than five per over, even though Jagota really climbed into him during one over. Sussex Premier League standings (all played six matches): 1 Roffey 160pts, 2 Brighton & Hove 139, 3 East Grinstead 133, 4 Eastbourne 106, 5 Preston Nomads 105, 6 Horsham 99, 7 Ifield 75, 8 HASTINGS PRIORY 69, 9 Cuckfield 68, 10 Middleton 62.